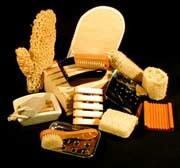 SoapBox can put together the perfect gift for any occasion - Try Us!! Our Soap dish combos make wonderful gifts... you can even choose which soap you'd like to go with the soap dish! Easy, attractive and functional! If you haven't seen them already - our Great Balls of Fizz Gift crate is REALLY popular! Very pretty - fun for young or well seasoned! 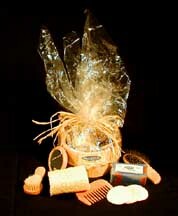 This is our Spa Bucket Gift Package... a terrific medium-priced-gift for anyone! A complete gift - appeals to men & women, young & perfectly-aged alike! We use handmade, exotic bamboo-wood baskets (round & square) to make any kind of gift basket you need. Very Special! Our Soap Sampler packs are the perfect little gift for any occasion... small, natural, inexpensive and attractive! It's even something you can use! We have a whole assortment of extras & accessories to choose from - perfect to fill out your gifts to family & friends. Everyone needs to accessorize! Talk about elegant! Our Dead Sea Bath Salts are colorful, truly natural and really good for you! Packaged in an old-fashioned milk bottle, you can't go wrong here!